Some people have a natural way with words, and can string them together in a way that creates a perfect harmonious flow. Others might struggle when it comes to verbally expressing themselves, but they might be better with their words when they write them down. 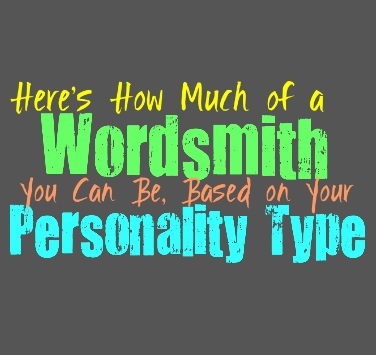 Here is how much of a wordsmith you can be, based on your personality type. INFJs are often wordsmiths, mostly because they find themselves drawn to how artful words can be. They also enjoy being able to express themselves in a way that showcases their intelligence. INFJs might be better at expressing these wordsmith qualities through writing, but they can often speak eloquently as well. INFJs simply enjoy many different subjects and the usage of witty and well-spoken verbal expressions, is something they are likely to be skilled at. Most ENFJs end up being wordsmiths, since they usually find themselves drawn to language. They enjoy being able to express themselves in a way that is both witty and eloquent. ENFJs strive to connect with others on many different levels, and often this requires being able to communicate with them through verbal or written expression. While many of the ways to understand others is through their body language, ENFJs seek to connect using their own wordsmith capabilities. INFPs can sometimes appear a bit quiet and even shy in some situations, but they actually can be great with words. Many INFPs enjoy being able to express themselves in a witty and entertaining manner. They often enjoy words, sometimes they find it easier to really express things eloquently by writing it down. INFPs can definitely be wordsmiths though, and often like being able to express themselves in this matter and connect with others. ENFPs are often unpredictable people, and will be drawn to things that they personally are passionate about. If they find themselves drawn to language and the written word, they will definitely be capable of being wordsmiths. Some ENFPs really love being able to put together witty statements, which will leave others completely in awe of their vocabulary skills. Some ENFPs might not find themselves all that drawn to language, and will be more passionate about other subjects. It entirely depends on the ENFP, but if they are drawn to language they will certainly become quick wordsmiths. INTJs are often great with vocabulary and witty expression, which does make them likely to be wordsmiths. While INTJs aren’t necessary seen as emotional or expressive people, they do enjoy being able to show their intellect by using the right wording. INTJs realize that being a wordsmith can really help showcase their skills and their knowledge in a way that is smooth and even a bit poetic. INTJs love learning and expanding their knowledge, and a vast vocabulary and ability to string words together perfectly, is definitely something they are likely to be interested in. ENTJs can often express themselves in a way that is concise and well-worded. They might not consider themselves to be wordsmiths, unless there is a need for it. If they are in an environment that requires a more skilled expression of their thoughts and vocabulary, then the ENTJ will definitely find a way to put things together in a witty manner. They simply strive to be efficient, and sometimes being a wordsmith can feel a bit like a stretch to them. They might prefer stating things accurately and precisely, instead of adding unnecessary words just to make their statements sound eloquent. While INTPs might not be verbal wordsmiths, they often enjoy expressing themselves via the written word. For INTPs it can be challenging to really take their thoughts and string them together in a way that really expresses what they are thinking. Their inner minds are so rich and intense, that they find it challenging to really convey their inner thoughts and feelings verbally. While they can likely find a way to say things decently, it still never seems to compare to what is going on inside of them. ENTPs can definitely be wordsmiths, since they enjoy being able to express their wit and intellect. ENTPs can often find ways to express their thoughts in a more eloquent manner, even though it usually only touches the tip of the iceberg. They like being able to express a witty vocabulary and love being able to find unique ways to phrase things which will entertain and even amaze those around them. ENTPs simply don’t like locking themselves into one subject or skill, and so words do often interest them. ISTJs don’t often feel the need to be wordsmiths, but sometimes they can be drawn to vocabulary as a means of conveying their more sarcastic side. ISTJs likely understand language fairly well, and believe it is important to be able to be easily understood by others. They often value efficiency more than other things, and want to be able to express their thoughts in a very clear and concise manner. The ISTJ who are wordsmiths, can often use this wit as a way to show their intelligence and even their penchant for sarcasm. While ESTJs can often express themselves verbally, they often prefer efficiency over eloquence. They don’t feel the need to be prefect wordsmiths, instead they want to say things in a way that gets to the point. ESTJs value being able to get things done and they work hard to focus on accomplishing their goals. While they do want to be able to express things clearly, that doesn’t require having to string together their words in some witty fashion. ISFJs can sometimes be wordsmiths, but this entirely depends on what their environment growing up was like. If it seemed important to express themselves in a witty and eloquent manner, then they are more likely to become wordsmiths. For them it is more about fitting in and being able to connect with those around them. ISFJs are often products of their environments and want their loved ones to feel proud of them. ISFJs desire to fit in as best they can, and sometimes this requires an eloquent expression of words. ESFJs can sometimes be wordsmiths, especially if they find themselves personally drawn to expressing themselves via their language skills. Many ESFJs do find themselves drawn to language and being able to string words together eloquently is often appealing to them. Being able to express themselves in a way that is both witty and even entertaining, is something they often enjoy. ESFJs also like being able to connect with others based on how they phrase things, which does require a bit of wordsmithing abilities. ISTPs don’t always find it easy to express themselves outwardly, but they do sometimes enjoy the written word. For them it is about being able to convey things in a witty manner, one that showcases their intellect. Most of the time though, ISTPs don’t readily show these others sides of themselves, since they can be a bit more independent. When they feel the need to step in and express the facts, they often do this in a more concise and clear manner. ESTPs can sometimes be wordsmiths, but most of the time this isn’t what they are drawn to. They are often more interested in expressing things in a factual and concise manner. ESTPs can be witty and sometimes sarcastic people, but that doesn’t mean they take the time to think about how they phrase things. They focus on living in the present and enjoy being able to follow whatever they are most passionate about, rather than simply focusing on their vocabulary usage. ISFPs are often interested in words and being able to express themselves in a witty manner. For them it is more about connecting with people, and being able to convey their inner emotions clearly. ISFPs can often be the poets of the world, and feel like words are a great way to express themselves and those deep emotions that are inside of them. ESFPs can definitely be wordsmiths, but it entirely depends on what they are drawn to. The ESFP who is passionate about words and expressing themselves eloquently, they will definitely be seen as wordsmiths. They love being able to connect with others and oftentimes this is why they become so drawn to verbal expression. ESFPs can be wordsmiths, and usually find it easy to express themselves in a way that can be both witty and appealing.